I wanted to share about my experiences leading the music for the Women of Faith, Women of Action conference held here in Fort Myers on February 20th. It was a real blessing and an honor to be a part of this event. Over 350 women were in attendance, to listen to the keynote speaker, Helen Alvare, as well as Father Miguel Gonzales and Cristina Martinez, and attend Mass with Bishop Frank Dewayne. What a line-up. And then there was me. I led a time of praise and worship, asking the women to join me in singing Shout To The Lord. 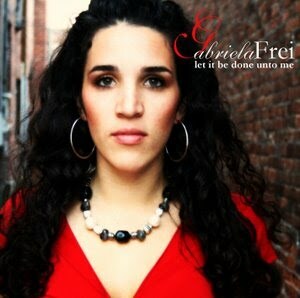 I then spoke a bit about my ministry in music, my growth as a songwriter, a few of my favorite songs, and then was blessed to play Transfigure (which you can listen to here at gabrielafrei.com as well as watch the music video). Later in the afternoon, I played and sang Go Light Your World as women holding candles processed throughout the theater. It was a beautiful moment, and a poignant reminder that we are Christ's hands and feet to our brothers and sisters, His light to the world. I also had a tremendous opportunity to spread the word about my own music ministry and sell CDs. I was so excited to offer these women a brand new, hot-off-the-presses CD, which even included a cover of Go Light Your World. I literally finished recording and producing this CD the night before the conference! But it was worth the effort to have a CD that I could proudly offer. I thank God for His faithfulness in providing opportunities. Now I will wait patiently, til the next opportunity arises. May His glory be fulfilled and accomplished.